It is a part of our culture to make big goals at the beginning of each year, but how many of us spend the time to assess where we are at the end of that same year? 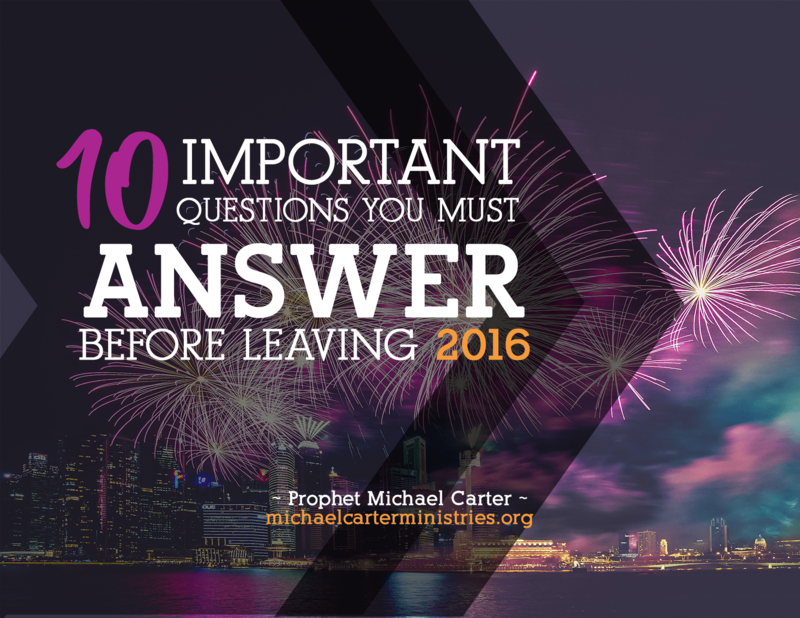 This list will help you to ask yourself the questions that will prepare you for an even better 2017. Did you make a list of goals or things you were believing God for this year? If so, what did you get vs. not get? (Include miracles, dreams, etc). Are there at least 10 people in your life who helped you this year? How can you make this known to them? Tell them now, that you are going to need them as a part of your (W)inner circle for 2017. What do you need from God for 2017? List it now. If you could change anything about you, what would it be? List specific things you want to lose. (temper, addiction, bad friendships, toxic relationships,etc). If you had died earlier in the year what would have been your legacy that people would have been talking about for Summer 2016? If it is a bad one you have the time to change it and work on things. Do you have a backup career or second set of skills that you have acquired? Who are you currently serving? (An elderly parent, a pastor, a volunteer cause, etc). How is your health? Is everything in check and by the way when will be your next doctor’s visit? (before 2016 ends). I don’t want you to compare yourself – you are unique, but who are the two persons you draw great inspiration from that basically sum up who you want to be in life? (Keep in mind that Jesus Christ is who you should ultimately want to measure up to. He is our measuring rod. See Ephesians 4). Please consider getting into a professional circle or getting a life coach that can help you reach your 2017 targets. Will you do that? You came into my circle in 2016 as a part of God’s plan to renew my life after falling from grace. God bless you for this post – I have already declared a better 2017 because God came through for me in 2016. My black has been repainted white by the Father’s hand’s. At the start of 2016 I wrote a this wats app status -“This year my faith in God will make a difference in me”. I never changed it and truly faith has made a difference in me! I look forward to the 2017 status I’ll write. God bless you and I know your plans will be blessed by God too! Thank you very much Prophet Carter. This is very helpful. Good Guidelines I will be using this nugget for more planning.